solar energy installation Huron Valley Electric MAVD 350 S. Main St.
MAVD tapped Huron Valley Electric for design and installation of a 20kW solar energy system at 350 South Main Street. The company’s core values led MAVD to make the building a visible symbol of green energy and environmental sustainability. 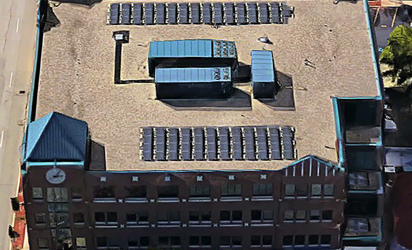 The solar energy system employs 95 traditional multi-crystalline photovoltaic panels to generate power for the four-story office building. The power is sent through a bi-directional meter that allows crediting of the energy created on-site. This lessens the 79,000 sq. ft. building’s fossil fuel consumption. As a result, this lowers their utility bill and impact on the environment. 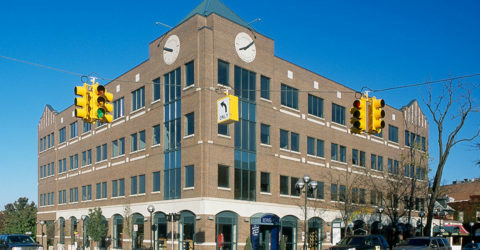 While the rooftop solar array is not visible from the street, a distinctive corner clock tower identifies the centrally-located building. 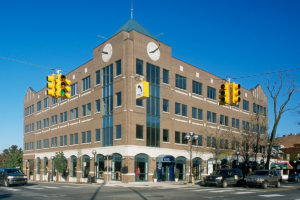 350 South Main Street also features a welcoming two-story atrium lobby. Founded in 1989, MAVD’s mission is to be the best at what they do in the markets that they serve. Furthermore, they accomplish their mission through teamwork, quality, service, sustainability, and community. Since its founding, MAVD has developed more than 3 million sq. ft. of commercial office space across Michigan and Colorado.